VISIT FAST-ACT AT NCT USA 2019! VISIT FAST-ACT AT NCT EUROPE 2019! 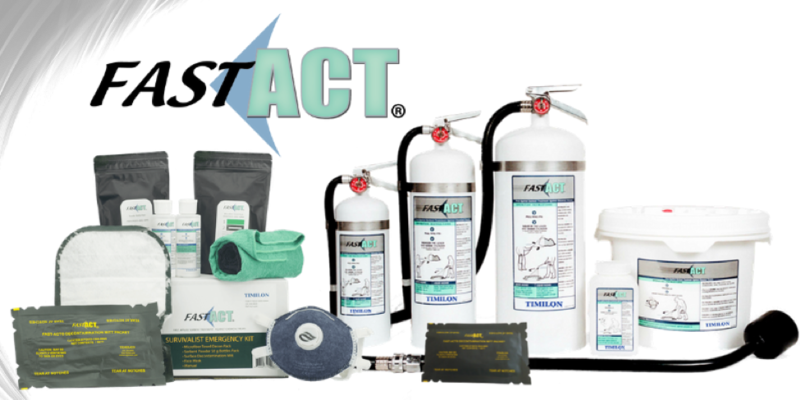 FAST-ACT®, a chemical decontamination provider, delivers Emergency Responders, Military, and HAZMAT personnel a decontamination solution unlike any other decon method currently available. FAST-ACT is a proprietary formulation of nontoxic high-performance specialty materials that are effective at neutralizing a wide range of toxic chemicals with the added capability to destroy CWAs. The FAST-ACT technology is utilized in a variety of applications, both for treatment and decontamination of liquid and vapor hazards, making the technology truly unique and versatile. 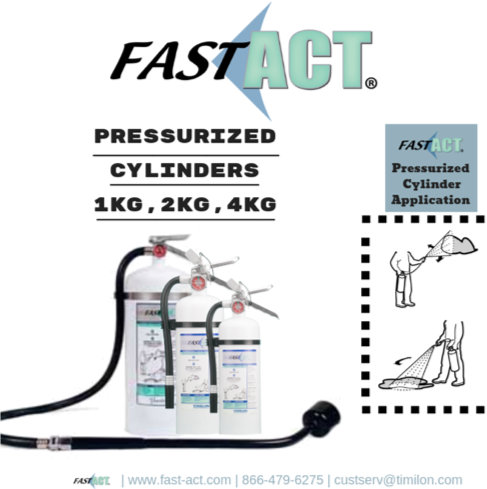 The FAST-ACT Pressurized Cylinder is a chemical vapor decontamination solution that rapidly neutralizes, absorbs, and/or contain chemicals upon contact. The Pressurized Cylinder has a similar operation to that of a fire extinguisher, it is easy to operate and requires minimal user training. The deployment of the FAST-ACT Pressurized Cylinder can be applied to both known or unknown chemical threats. This vapor release decontamination solution has many different uses and applications that include air space decontamination for HAZMAT teams, neutralizing acidic gasses, rapid decontamination of gear, chemical vapor decontamination in enclosed spaces, and used in decontamination shelter/tent cleanup. Their effective vapor decontamination cylinders are offered in a variety of sizes including 1kg, 2kg, and 4kg. FAST-ACT® has just introduced a revolutionary Decontamination Guide that is available online through a large index chemical list, as well as through the Apple Store and Google Play. The FAST-ACT Decontamination Guide App is the largest directory of chemical threats that list decontamination solutions for immediate action and neutralization of potentially toxic chemicals. This innovative decontamination app provides Hazmat Personnel, Police, Military, and First-Responders the ability to obtain pertinent information that is needed quickly for the decontamination of chemical threats, and most importantly it offers knowledge on the best decontamination solution to implement when using the FAST-ACT chemical decontamination products. For those interested in accessing this extensive chemical threat list and decontamination solutions can download the app from the Apple Store or Google Play and sign up for an account on the App using a government email address or organization email – and once the email is approved, they will immediately gain access to the revolutionary Decontamination Guide by FAST-ACT. If, or when, a chemical attack takes place in a large venue event you will want/need a fast decontamination plan and method to effectively neutralize the chemical compound that was aggressively released into the environment. Chemicals travel throughout the impacted environment either on surfaces or through the air, requiring a decontamination technology proven to neutralize a broad spectrum of chemicals including CWAs. During a chemical attack time is of the essence and many decontamination methods require indication of the chemical that is at play in the environment, therefore a decontamination technology that does not require identification of chemicals for utilization can be a game changer for chemical neutralization and decontamination technology, particularly for event protection or any large venue defense. This article is sponsored by First Applied Sorbent Treatment – Against Chemical Threats (FAST-ACT), which is a product that immediately contains or neutralizes acids, bases, and other chemical hazards (including CWAs) FAST-ACT provides safety benefits beyond traditional measures. The broad range of utility makes FAST-ACT a valuable tool for a variety of environments and any place where hazardous chemicals are a potential threat.